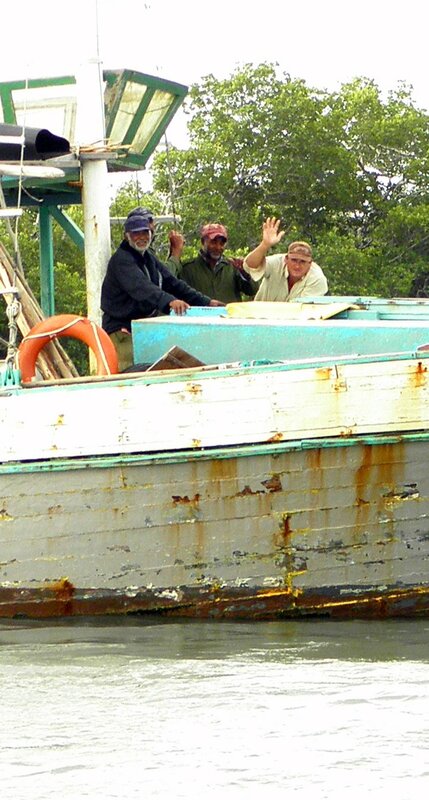 Cuba established a commercial fishing fleet of about 70 boats about 20 yrs ago. They are mainly concrete hulled, shallow drafted, fishing boats; simple, basic boats around 50 – 60 ‘ long with canvas covered work areas and a small building – cabin – where I guess the crew sleeps , in turns probably because the cabin is far too small to fit all the crew we see on board at one time. But maybe they sleep in one end of the hold below as well, I do not know but if they do it would be like sleeping in a tomb. The fish also goes into a hold below deck. Into ice I think, because there is an ice machine on the dock so I presume they ice up before they go. Unfortunately like everything else in Cuba the fishing boats look like they have not seen a day of intensive maintenance since they day they arrived.The concrete is steel reinforced and many of them have running rust stains over the concrete hull which means the concrete is slowly cracking open. We have seen some continually pumping out water. It is really a horror to see especially compared to the boats the guards and the search and rescue run about in. It’s the ambulance at the bottom of the cliff thing but at least the ambulance looks like it might get to rescue in time ! Fish are everywhere. The thousands of miles of mangroves and the reef make the best of breeding grounds. Fish quite literally were jumping about us most of the way down the west side of Cuba, flyng fish and we caught a bonito ourselves. The life of the fisherman is very hard here. They go out for 10 days at a time and come home for five. The boats moor up between stints. We watched the boats come in one evening as we waited on oil for our boat. On the wharf were five or six factory staff and just as many men from the Interior , the “little green men” who are the governments guards. 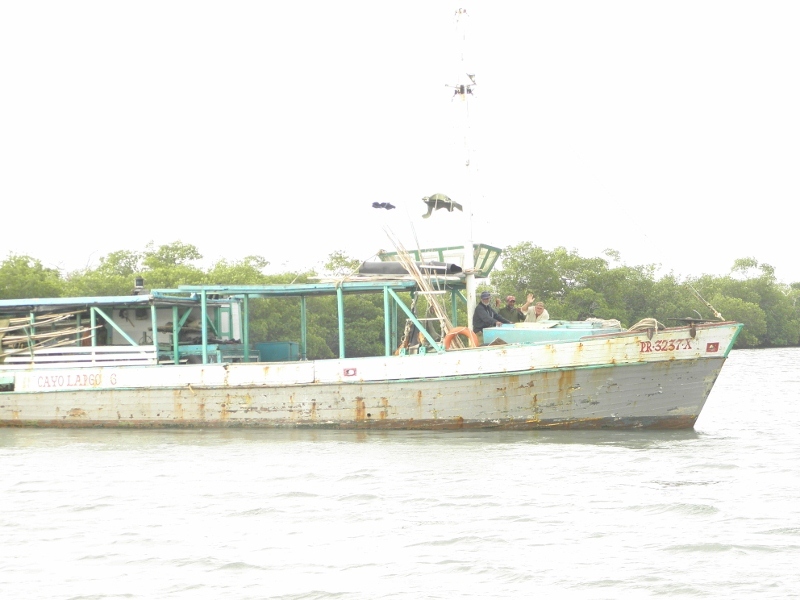 A couple were processing us and our request for transmission oil , two or three stayed guarding the guard station and two or three went and boarded each fishing boat as it came in and inspected bags , holds and doing paperwork. 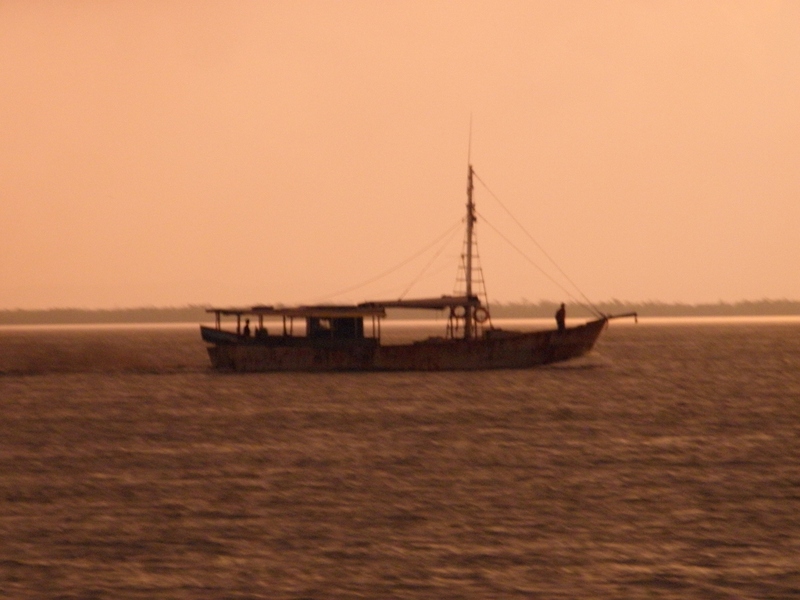 Each fishing boat’s crew seemed to react quite differently to them. The first one in seemed quite unsociable to the guards, others seemed OK with the guards and one boat even gave them a bag of small fish. There does not seem to be any incentive for the fishermen to catch more and they generally all look lean and hungry compared to the guards. It seems that the working mans efforts are no longer valued here and that is strange especially for a communistic country. If the fisherman caught/brought back to the factory more fish then there would be more work for everyone else and eventually surplus product to sell.